From school drop off to work to date night, the WYO-HORSE jewelry and accessories collection is designed for vibrant women who do not slow down and want to look great while doing everything. A woman who loves modern southwestern style with a Boho flair. 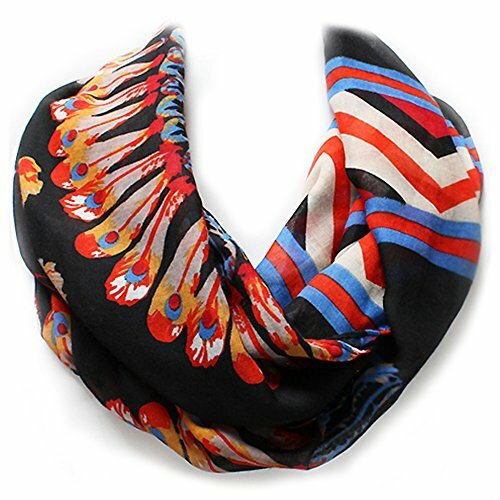 This scarf features a western tribal feather design in coral, black or ivory and can be wrapped in many different ways to complement any outfit. It's an extra layer of warmth in the winter over a sweater or blazer, and protection from the sun or a cool evening with a tank top or tee during the summer months. It brings that finished look to any outfit while adding a splash of color and some Southwestern flair. This scarf makes a thoughtful gift for birthday, Mother's Day, Christmas or Valentine's Day for your mom, wife, sister or favorite aunt-anyone who likes to accessorize in style. 100% POLYESTER LIGHTWEIGHT SCARF INCLUDING INSTRUCTIONS ON VARIOUS WAYS TO TIE FOR DIFFERENT LOOKS AVAILABLE IN 3 COLORS. This classic western-style scarf measures 24" by 34" flat and wraps in several different ways around both neck and waist and features a western feather design. FOR THE WOMAN WHO ALWAYS LOOKS PUT TOGETHER. She knows that a scarf makes the perfect accent to any outfit and knows exactly how to bring the whole look together. This scarf is for her. Available in coral, black and natural ivory.